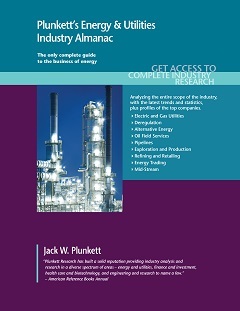 Plunkett Research lists top 500 companies in the Energy & Utilities, Oil & Gas Industry and names the top trends changing for the mid term. How is the industry evolving? How is the industry being shaped by new technologies? How is demand growing in emerging markets and mature economies? What is the size of the market now and in the future? What are the financial results of the leading companies? What are the names and titles of top executives? What are the top companies and what are their revenues?